With the Attention SL Cube set out to create a new benchmark for value and performance. Borrowing inspiration and ideas from Cube's high end race bikes, Cube's designers selected a RockShox air sprung fork for the ultimate in easy adjustability and smooth, progressive bump swallowing performance. 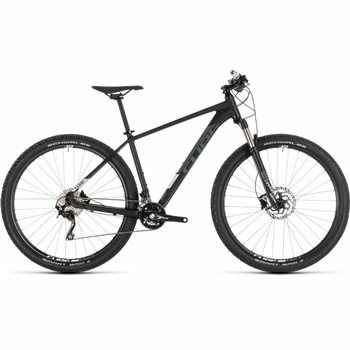 Cube added powerful hydraulic disc brakes and a 180mm front rotor for assured stopping in all conditions, and finished off with Shimano's slick-shifting and reliable Deore and XT 2x10 gears. It's all bolted to Cube's light, agile, comfortable and adaptable 6061 aluminium chassis - and, because of Cube's Size Split setup, there's an Attention SL to suit every rider. Size- Split: 27.5: 14", 16", 18" // 29: 17", 19", 21", 23"